Small, simple, and ready for action, is Princeton Tec's Bot Headlamp. This is the youngest member of the princeton family but, has the same ergonomic features of the older members. Designed with two Ultrabright LEDs housed in a variety of wild colors will certainly be the center of attention, but look beyond that. 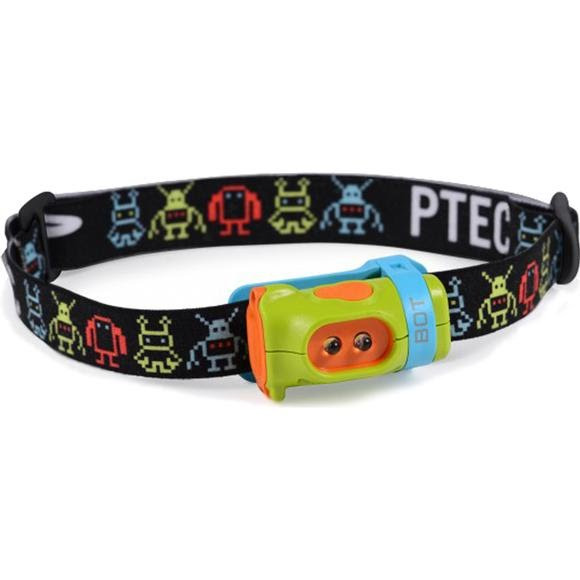 Small, simple, and ready for action, is Princeton Tec &apos;s Bot Headlamp. This is the youngest member of the princeton family but, has the same ergonomic features of the older members. Designed with two Ultrabright LEDs housed in a variety of wild colors will certainly be the center of attention, but look beyond that. The Bot is built with the same ruggedness and reliability as the rest of the headlamps in Princeton. Lights rated at Level 1 are designed for water resistance to splashing and quick dunkings. If a light with a Level 1 rating is accidentally submerged for a longer period of time, the batteries should be removed and the cabinets should be carefully inspected for signs of battery leakage. If water has entered the housing, the light should be dried and batteries replaced. Multiple settings on many of our products give you the flexibility to adjust your light&apos;s brightness and/or beam width to illuminate greater distances or to conserve battery power, depending on your needs.